Lucky Larry's Lobstermania 2 is the official sequel release to the highly popular Lucky Larry's Lobstermania slot that became such a big hit for slots developer IGT on both the land-based and online platforms. The original was such a cult phenomenon that it was only a matter of time before the second release hit the market and it is a welcome return to the humble fishing port of Larry for slots players that fell in love with the slot the first time around. At first look there appear to be some big chances but also a lot of stuff that has been kept from the first outing. 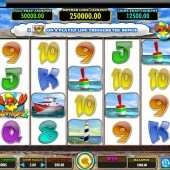 This slot is a 5 reel, 40 payline title and instead of being set against the backdrop of a quay side this time we are greeted with the reels being set against a beach with a picturesque lighthouse visible in the background. The symbols included on the reels are a buoy, a fishing boat, a lighthouse, a fisherman's hut, and the regular 8, 9, 10, Jack, Queen, and King symbols. There is a regular Wild and a super Wild on this slot. These are represented by different coloured Lucky Larry's Lobstermania 2 logos. The regular Wild has the ability to substitute for all other symbols, except for the Lucky Larry Bonus symbol and the super Wild symbol, to complete any possible winning combinations. The super Wild has the power to substitute for all other symbols, except for the Lucky Larry Bonus symbol, to complete winning combinations across the reels. These Wilds also appear Stacked! The bonus game is a bit of a complexity but bear with us. You will need to hit three or more Lucky Larry Bonus symbols across the reels to trigger the bonus feature. Once triggered, you will have the chance to play one of two games. You must pick which bonus game to play. You can earn up to a 95x multiplier before being taken to the bonus game of your choice. The first is the Lucky Larry's Buoy Bonus 2. Let's not beat around the bush. This is basically just a slightly advanced version of the Buoy Bonus in the original. You will be taken to a screen where you must select one of three regions from Australia, Brazil, and Maine. Each one will reveal either 2, 3, or 4 picks. Every buoy that you then pick will pull up 2-4 lobsters and each lobster will have a multiplier of between 10x and 575x attached to it. There is also the potential to pull up the golden lobster. The golden lobster is the key to entering one of three sub-bonus games. Which sub-bonus game you enter depends on which region you initially selected at the start of the Buoy Bonus 2. If you chose Australia then you will be taken to the Kangaroo Bonus. You can win up to an 800x multiplier in this game by picking from a selection of kangaroos in a field. If you chose Brazil then you will be taken to the Octopus Bonus where you must choose from a number of treasure chests being held by an octopus. You can win up to a 1,000x multiplier here. If you chose Maine then you will be taken to the Pelican Bonus. 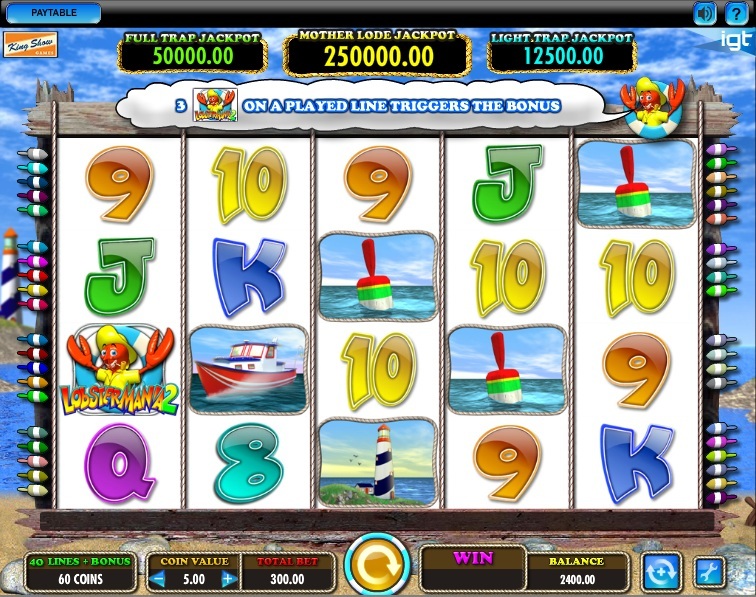 Here, you can win up to a 625x multiplier when you pick from a choice of pelicans on the roof of a fisherman's boat. The second is the Lucky Lobster's Free Spins Bonus. This is a simple free spins bonus round where you will be given at least 5 free spins. If you hit three Lucky Larry Bonus symbols across the reels during the free spins then you will win an additional 5 free spins. Trigger up to a 50,000 Coin Jackpot! That is still not all from this slot. There are Jackpot Scatter Wins. On each spin, a Jackpot symbol can appear over any symbol except for the Lucky Larry Bonus symbols. If you land three or more of these Jackpot symbols then you can trigger a jackpot prize worth up to 50,000 coins. There is the Light Trap Jackpot, Full Trap Jackpot, and the Mother Lode Jackpot to trigger with the latter being the biggest one. There is also the Multiplier Feature. A 5x multiplier has the potential to appear on either the buoy, lighthouse, fisherman's boat, or fisherman's hut on any spin. A 3x multiplier can appear on either the buoy, lighthouse, or fisherman's hut on any spin. Lucky Larry's Lobstermania 2 is a highly anticipated slot release. We all knew it was only a matter of time before it hit the casinos. It has a lot going on. The original was reasonably simple with chance to pick lobsters to win prizes but this offers Stacked Wilds, multipliers, free spins, and a Pick 'em Bonus with sub-bonus games as well. It is quite overwhelming if you're not used to playing your slots but it will really excite those that loved the first and wanted more action and bonus features. Is it as good as the original? Hard to say. Some might see it as an evolutionary step but others might feel like the complexity of the new added features have tarnished the simplistic beauty of the first. I like it. Yes, it does feel a bit much at times but after the original I demanded more from the sequel and it looks like I got my wish. If you enjoyed this then you might want to check out Aristocrat's stunning Pelican Pete slot that appears to have slipped under the radar.